The Three Best Treadmill Workouts Ever. Call me crazy, but I like making my own treadmill workouts. Yes, I know you could download an app or use a pre-programmed workout on your treadmill, but I think it’s more fun to have a hand in creating something for yourself. These can easily be adapted to the elliptical or another form of cross training too. 1. The Ultimate Fartlek- This is one of my all-time favorite workouts. I like the element of surprise, and the constant change in pace makes the workout go by quickly. You’ll need: a treadmill, index cards (or a piece of paper cut into squares) and a pen or sharpie. 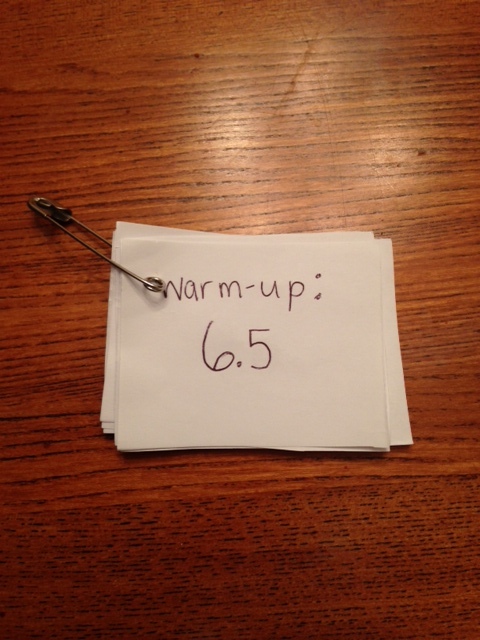 For a 5 mile workout you need 16 cards: write your regular warm up and cool down pace on two cards and label them warm up and cool down. 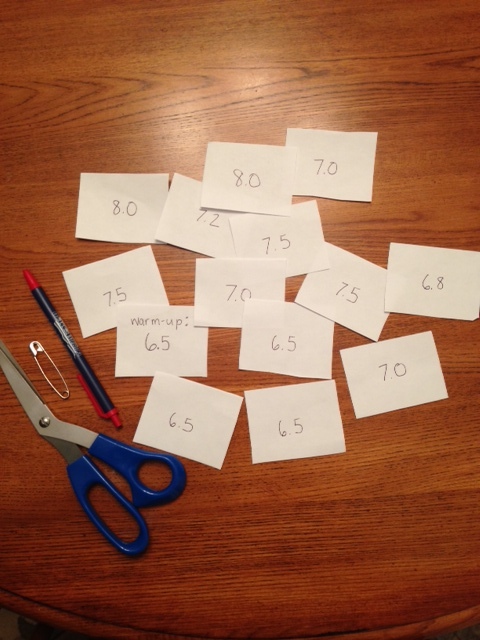 For the remaining cards, write a variety of paces: for example, 6.5, 7.0, 8.2, 7.3, 8.0. Make sure to include some slower paces in with the faster paces so you have some recovery time. Keep the warm up and cool down cards out and shuffle the remaining cards. No peeking! Start with the warm up card for 3 laps. When you’re getting close to the end of your third lap (3/4 mile) get ready to flip over your next card… then whatever that card says, you have to run that speed for one full lap (1/4 mile). Repeat until the deck is finished (your last card should be your cool down card for 3 laps). Index cards work perfectly and cut down on prep time. You can even use bright colored cards or sharpies to spice things up (hey, it’s the middle of winter and every little thing helps). I’ve been using squares of paper pinned together with a safety pin. There’s something satisfying about ending a workout with a pile of balled up paper scraps. 2. 60 Minutes- You don’t have to watch 60 Minutes while running this workout, any TV show or podcast will do. I’m a total weirdo and sometimes I like doing workouts without any form of entertainment, but there are many workouts that I wouldn’t have gotten through without Netflix. Run 3 minutes fast, then 2 minutes easy. Repeat 7 more times (for a total of 8 times). The exact paces here don’t have to be the same every time. Aim for 15k-half marathon race pace for your fast segments at first, then drop it down to 10k pace or faster as you get further into the workout. The easy segments should be easy, but fight the urge to walk. You could also do this workout as 2:30 fast/ 2:30 easy or some other combination. 3. The Grab Bag- This one of is from my high school cross country coaching days. We frequently had tornado warnings and hurricane warnings where I coached in Virginia, and we would be stuck indoors. Since I had about a million index cards lying around, I would write down whatever came to mind and throw the cards in a bag. Each kid would get to choose a card and then we would do them together. You’ll need: whatever you have! If you have a treadmill, great. If not, you can use weights, a mat, a pull up bar, exercise ball, bands, the hallway, stairs, etc. You’ll also need index cards (or a piece of paper cut into squares) and a pen or sharpie. Write an exercise that will take about 1-2 minutes on each card. Don’t forget to include a few fun ones (water break, dance break, etc.). When I was coaching cross country I would make a few cards that said “make a ridiculous face” or “sing your favorite song,” which you can do on your own too (even if you don’t have teammates to make faces at). Shuffle the cards and place them in a pile or in a small bag. The best part of this workout is that you have no idea what you’ll have to do next… it’s like having your own personal trainer. You can keep your cards and recycle them for next time, and add new exercises when you think of them (or take out ones that you don’t like). A good playlist makes this workout even better. Do you have any ideas for treadmill workouts or indoor workouts? I’d love to hear them! I’m thinking of doing a little blog overhaul… maybe trying to focus in on more topical posts instead of occasionally writing about what I’ve been up to lately. My English teachers used to tell me to get rid of the first paragraph when I wrote essays because it took me awhile to get to the point. They were right. So, it’s kind of the off season for running, or at least it used to be that way. Recently I’ve noticed a trend where runners are training for goal races throughout the year, not just spring and fall. But, it’s important to take a short break between training cycles (whether that’s now or another time of the year) and enjoy some good old fat and happy time. And then, when you get started again with your training, wholeheartedly ready to lay it all out there and push yourself to your limits, your body is confused. What are we doing? Why do my limbs feel like jell-o? You didn’t forget how to run. You just lost a little fitness, and probably most of that was a loss of coordination (sometimes referred to as neuromuscular fitness) and changes to your running economy. Luckily you’re not starting from zero again (hey, thanks muscle memory) and you’ll start to feel like yourself again soon. It usually only takes a few weeks for things to return to normal. For now, though, let’s talk about your favorite things to do in the off season. I’ll go with my top 3: sleep in (yeah right like that’s happening with two little ones in the house, but a girl can dream), go on a weekend trip (so much easier to pack plus I don’t have to worry about fitting in workouts), and do it large for breakfast. I usually have to grab something quick for breakfast but when I don’t have to run in the mornings I will take full advantage of that extra time and cook eggs and pancakes or pick up some donuts as a treat. So, what are your favorite things to do in the off season? It’s almost Turkey Trot time, which means it’s time for some final tune-up workouts. Lately I’ve been doing speed workouts on Saturdays, mostly because it works best for my schedule and I have bonus workout partners to keep me motivated. This past weekend, I did one of my favorite 5k workouts: 5 x 1000 meters at 5k race pace with 400 meter jog recovery. The science behind this has to do with the amount of time you spend running at your VO2 max. You should aim for intervals that take between 3 and 5 minutes at your VO2 max (or your 5k race pace). After a 2.5 mile warm up, I ran my first 1k in 3:46 feeling very relaxed and focused. I jogged a lap and ran my second 1k in 3:45. At this point, I assessed how I was feeling a decided to push a little harder on the next interval. This is usually how I race my 5ks as well. I ran the next two in 3:35 each. The second to last 1k was starting to get difficult, and I felt myself breathing pretty hard. On the last interval, I went as fast as I could, and crossed the line in 3:25. I finished with a (very slow) 2.5 mile cool down. I evaluated how I did, and decided that I could have run the first two about 5 seconds faster. This workout is a great confidence-builder and helps you to visualize your race at the same time. After the workout, you should take a look at your times and review how you felt throughout the workout. Did you run too hard in the beginning? You shouldn’t feel lactic acid in your legs until at least the halfway point of the workout. Was the pace too easy? If your last interval (the one you finished as fast as possible) was much faster than the rest, then you probably could have run the first few intervals a little faster. There is a lot of useful feedback you can take from this workout and use for your race. Some variations of this workout are: 4 x 1200 meters at 5k race pace with 400 jog recovery, 5 x 4 minutes at 5k race pace with 2 minutes easy running in between, 6 x 800 meters at 5k race pace with 400 meter jog recovery. Always run that last interval as fast as you can, and visualize yourself powering to the finish line. Also, if your Turkey Trot is a 10k, you can double the number of intervals and run them at your 10k race pace (and shorten the rest a little if you’re feeling adventurous). My race this past weekend (ok two weekends ago) was such a fun experience. No, I didn’t PR or win any prize money like I had envisioned back when I started training this summer… but it was still a great race that enjoyed from start to finish. The weather was perfect, I had great company for the first 20 miles, and my post-race margarita was one of the best I’ve ever had. I know there are lots of people who have found themselves in a similar situation. Maybe you missed training due to work, travel, family, weather, or something else. Maybe you considered bagging it but didn’t want to lose your entry fee. Maybe you lost motivation at some point and your training has suffered. There are a lot of things that happen between when you sign up for a race and when you line up on the starting line. So, there are a few thoughts on how to make the best of your race experience. 1. Try something new. I know, gasp! How dare we defy the old running adage. Well, you can find ways to mix it up without committing a major running crime like racing in brand new shoes. Get some funky laces, wear some bright shades, or even try out a new outfit (just make sure you wear it once in practice before the race). 2. Start off with a slower pace group than you originally planned. Sometimes running at a slower pace in the beginning will help you feel good longer and allow you to push the pace toward the end. It’s a great way to run a fast time, and even if you don’t get your PR you may still surprise yourself and run faster than you expected. 3. Take in the crowd. If you’re usually in your own head during a race, take this opportunity to soak in the support from spectators. I dare you to not get a little pumped up when you high five the local high school mascot. He probably got up at 5 am just to don that ridiculous suit and cheer for you. 4. Race your way into shape. A race can be a great training run and an opportunity to practice your pre-race routine and race strategies in an optimum environment. Choose another goal race in a few weeks and use this race to practice fueling, hydrating, and running part of the race at your goal pace. 5. Plan your post-race celebration. You earned it. …the re-launch of Piece of Cake Running, our training plans and personalized coaching services. Last year we took a purposeful step back from Piece of Cake Running. With the birth of our daughter in August 2013, we knew it would be difficult to devote our time and attention to anything besides our little tiny human. Let’s be honest, just taking a shower required a complicated choreography of each of our schedules. Do you guys really like cake or something? Who doesn’t like cake? It’s delicious. But our nom de guerre comes from the desire to spread the movement of running in it’s simplest form. It doesn’t have to be complicated by fancy gadgets and special diets. It’s putting one foot in front of the other. Anyone can do it. We’re not into cookie-cutter training programs. Your training plan is developed just for you, based upon your experience, and your personal goals. So, if you’re in the market for a coach or need a training plan for an upcoming race, we would love to help, whether you’re new to the running game or a seasoned veteran. And if you know anyone who might be interested, please let them know about us. We offer a free month of online coaching if you refer a friend. Sharing is caring! 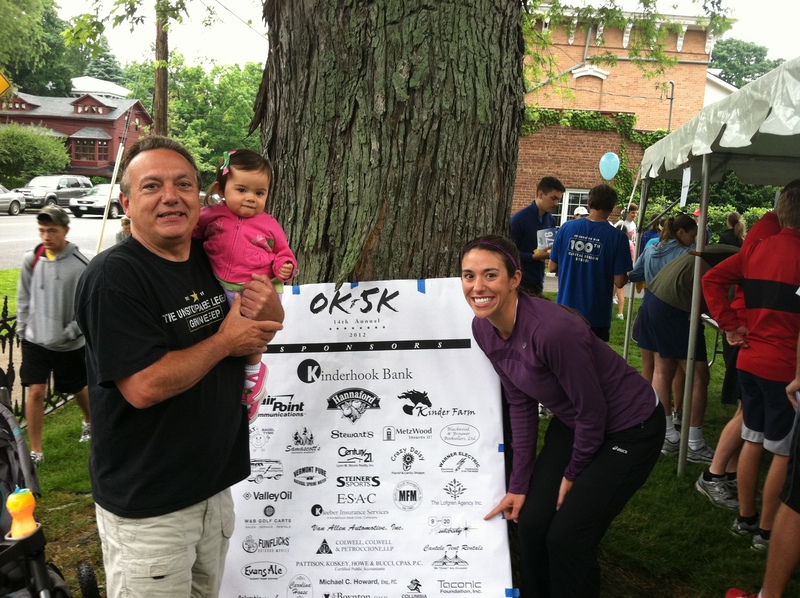 9&20 Autobody’s “Talk to Tony”… Dad has been race sponsor of the OK 5k since it began! I have a shiny, new 5k PR today. I am not an elite runner. I am not even a local race winner. I am an average, middle-of-the pack runner. My 5k PR is now 21:38. I know that many of you just read that and thought, “I could run a 21:38 5k in my sleep”. But, for me, 21:38 is a big deal. My previous 5k PR was 23:20 and that was five years ago. 21:38 is FAST in my book. I’ve been running for eighteen years now (I started running the summer before 7th grade. I was training for modified cross-country!) and I will be turning thirty this year. A 5k PR is an awesome accomplishment for me. 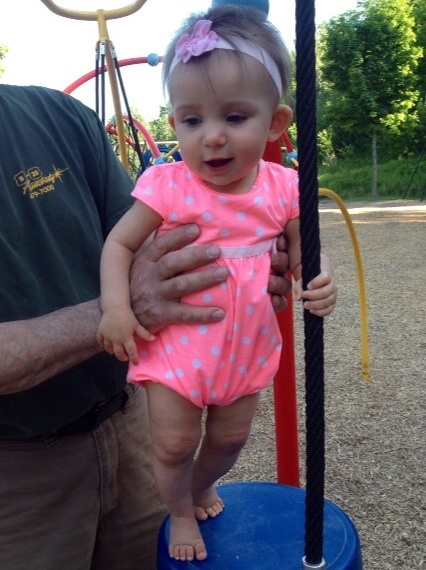 Here is the cherry on top… nine months ago I gave birth to my beautiful daughter. That’s right; I am saying that I am faster after baby AND faster now that I’m older. How did this happen? I’ll tell you…. Successfully running my 5k PR took a lot of hard work. I am not going to lie. But, I am so glad that I worked at it. After giving birth to my daughter, Mia, I was only able to walk for exercise until I was cleared by my doctor. But, as soon as I was given the okay, I was running! The first mile I ran after Mia’s birth was painful. I felt so out of shape. My legs felt heavy (heck, I was heavy). My stride was off. And, it was hard to breathe properly. I couldn’t help but feel a little disappointed. I had ideas of how my first run back would be. It was going to be glorious. This was not how it was supposed to go. But, I shook it off and got back out there day after day. My first “race” after Mia was the Troy Turkey Trot 5k on Thanksgiving morning. This race is an annual tradition for my family. I had been back at running for less than a month and I finished my run in 27:56. Not too bad for a chunky, tired, nursing mama to a two-month-old! 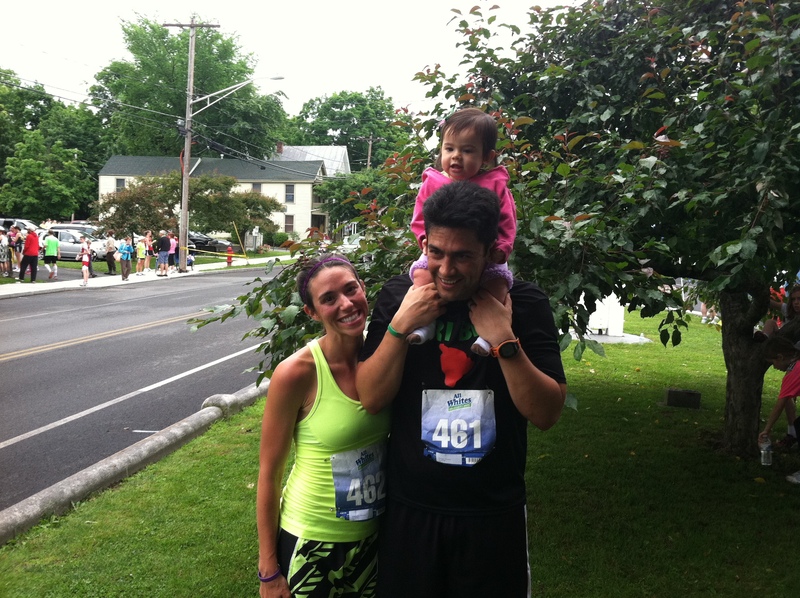 After this race I decided that I would run a half marathon in March, six months post-baby. And, this would be my comeback. I was hoping for a half marathon PR and my body back by the end of my training. For races, I usually just print off a training plan from the internet or run enough to get by. But, this comeback meant so much to me. I wanted to crush my 1:56 half marathon time from 2006. I was in need of help. I turned to my favorite runner (and sister), Mollie, for some guidance. Mollie had just started up Piece of Cake Running and was willing to take me on as an athlete. 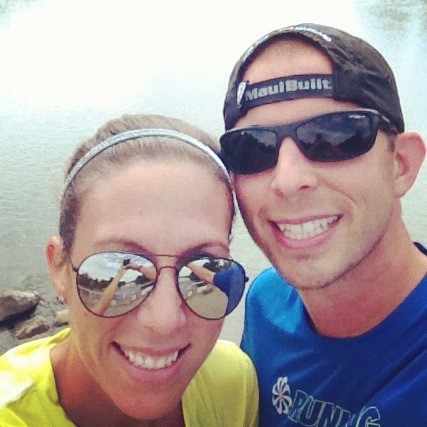 In December, she became my online coach and began training me for the Shamrock Half Marathon. Training in the upstate NY winter was rough. Training in the winter with an infant was even rougher. I had to deal with freezing weather, snow storms, sicknesses, missed naps, and a lack of sunlight (as well as a lack of hours in the day)! But, I dove in and trained away…even if it was around my cul-de-sac, in the dark, during a snowstorm, with my headlight on. I didn’t want to let my coach down or my family down. And, I wanted Mia to be proud of her mom. I wanted to be a good, strong, healthy role-model for her! All of my work paid off. I raced my heart out and PR’d at Shamrock with a finish time of 1:47 and again, a month later at the Lake George Half Marathon, finishing in 1:43. I even placed second in my age group! I know that I couldn’t have done it without Coach Mollie and her personalized workouts. She believed in me and gave me everything that I needed for success. I also couldn’t have improved this much without my family. They jumped at the chance to babysit Mia so I could go on long runs with my husband on the weekends. In addition, believing in myself and my goals really made a change in my running! After my second half marathon PR, I really started to feel like I could do anything. I was a new mommy and I was getting faster! I decided that I should try to get some more PRs, while I was still hot. The 5k was up next! 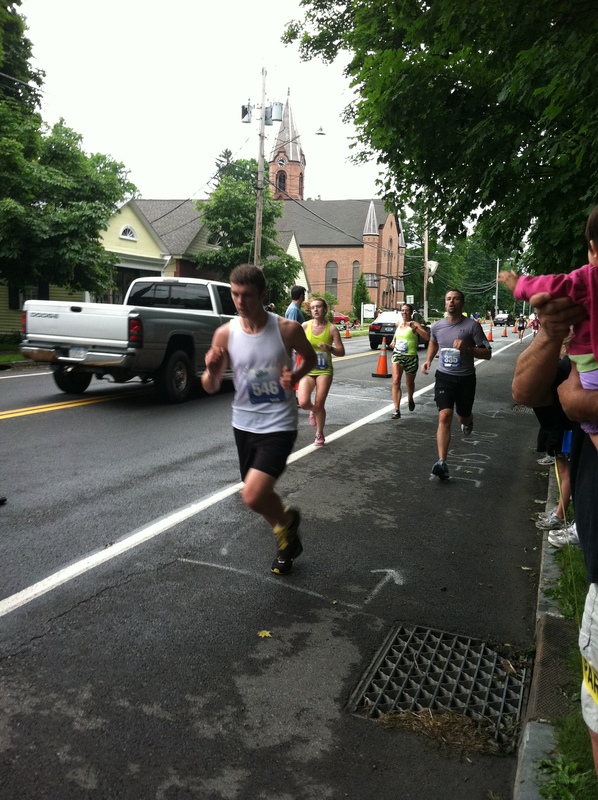 I always run the OK 5k in Kinderhook, NY. I even ran it last year, when I was seven months pregnant. My father is one of the race sponsors and my sister still holds the female course record. It is a fantastic race. I decided that this would be my first, fast 5k. I wanted a PR and I wanted it bad. My goal was under a seven minute mile for the race. Guess who met her goal? Yup, this girl! 6:58 per mile AND 3rd in my age group! I couldn’t be happier! Running toward the finish… on my way to a new PR! Today I have a new 5k PR, but I am hoping that tomorrow I can say that I bettered my PR. This weekend I am running the HMRRC Father’s Day 5K Run. I would love to beat my time of 21:38, even if by a second. It is supposed to be a warm, sunny day here in the Albany area. Hopefully, the weather won’t get in the way of my goal! I’m beyond excited that my cheering section will be at the race. This includes my dad, Mia, and her dad on Father’s Day. Wish me luck….